We were well on track to complete Phase 2 BEFORE the rainy season started BUT due to losing a week of progress when Moneygram prevented me from transferring funds we have been unable to get the building painted – everything else is however finished. Although this is very disappointing, when I set out on this project in January I never thought we would have got this far this quickly so I am trying to stay positive despite my frustration. The school is however in the process of having ALL the furniture made for Phase 2 and this should be completed fairly soon. I would like to say a HUGE THANK YOU to everyone who has donated and supported me with this project and as soon as the rainy season abates we will complete the building. 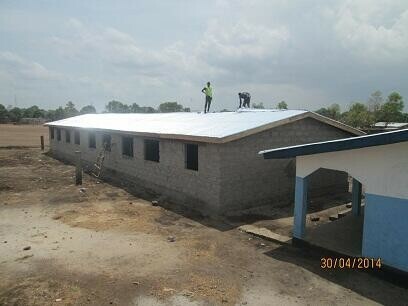 The next Phase will be the construction of extra toilet facilities at the school.